While his bank account has certainly been a major beneficiary, American Phil Mickelson threatens to be remembered as being one of golf’s “nearly men” as well as one of our greats. That alone is not a bad effort considering Mickelson does have five major championships to his credit. It’s just that he has been runner-up an astonishing 11 times…which is more than any other modern day player. Of course the great Jack Nicklaus had 19 runner-up finishes in the four majors during his stellar career, but the Golden Bear did offset that with 18 wins, meaning he had a pretty good strike rate when he was in contention. Mickelson, on the other hand, has been desperately unlucky on so many occasions and his latest effort in the British Open is a perfect example. Going into the final round, Mickelson trailed Henrik Stenson by a shot then went out at Royal Troon and shot the second-best score recorded that day, a marvellous 65. The only problem was, it was Stenson that shot the best score of the day, a 63 to beat ‘Lefty’ by three. That’s about as unlucky as you can get. And had the currently sidelined Tiger Woods not won 14 majors, it would be Mickelson we would be hailing as the greatest player of the modern era – not one of our unluckiest major men. 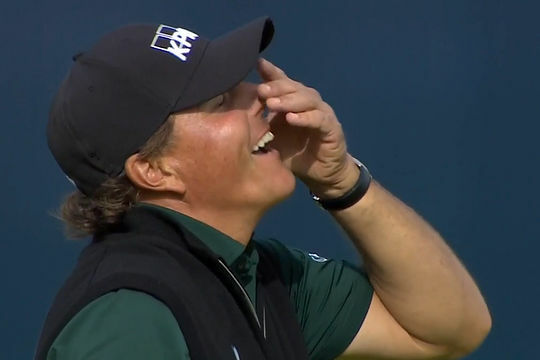 With three US Masters, one British Open and one US PGA to his credit, Mickelson is probably not done yet but as one US reporter pointed out, if the cards – and putts had dropped his way, he could have had as many as nine more majors to his credit. “It still stings,” said Mickelson after he threw everything he had at Stenson in that memorable final round, only to watch the Swede, with no majors to his credit, grab his place in history with some putts from the next suburb to claim victory. Only time will tell if Mickelson, at the age of 46, can improve his winning versus runner-up percentage.